It was also announced by 343 Industries today that Halo 6 was on its way. “Halo 4 was about the Chief finding his humanity and we felt that story worked out really well. 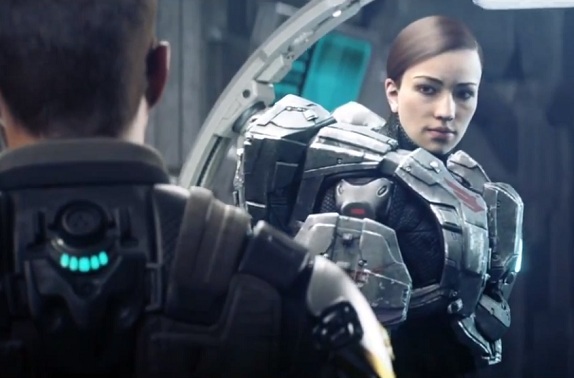 What we didn’t count on was the fan reaction to Commander Sarah Palmer’s character in the game and the role she took on during the two seasons of Spartan Operations. Fans have been extremely vocal in their support for the character and asked for more of her. Accordingly, we have taken the step of featuring Palmer’s Spartan as a lead character in Halo 6. Obviously with the death of Cortana in Halo 4 we needed a strong female lead and Palmer was the obvious choice. That’s a pretty massive change to the game, I hope they get the character right as she’s a bit ‘terse’ for my liking. God, I hope the Master Chief doesn't fall in love with her now that he's found humanity! What do you think? Do you agree that Sarah Palmer should replace Cortana in Halo 6? For clarity, this was an April Fool's that some people took way too seriously! 2 to 1, Chief willl bring Cortana back. It's just not Halo without her. I have always believed that Cortana played an integral role in the development of the Halo series. She was just as important to Master Chief as Master Chief was important to her. It just seems wrong to decide to separate this union as it was a great joy to follow them through all the Halo games. One of the best highlights for me in Halo 3 was the point at which Master Chief was reunited with Cortana....the game then felt whole again. To bring about the humanity in Master Chief made Cortana all that more special, and it even brought her out as a more human A.I. I was disappointed and sadened at the build up in Halo 4 where I had the feeling that Cortana in some way was not going to make it. Then it happened. I would like to hold out hope that 343 Industries will still consider Cortana as a main part of the Halo evolution, of Master Chief's evolution, and that trying to "replace" her is not the way to go. Just because she has been around the entire series, and 343 wants to make their own "Halo", doesn't mean that a main character should be "let go" and replaced. Especially since the union between Cortana and Master Chief is a giant aspect of what makes the Halo series, well, Halo.